We’d love your help. Let us know what’s wrong with this preview of We All Fall Down by Daniel Kalla. Alana Vaughn, an infectious diseases expert with NATO, is urgently summoned to Genoa by an ex-lover to examine a criticall Not since Pandemic have we seen a thriller like this from bestselling author Daniel Kalla: The plague has hit Italy. Can Dr. Alana Vaughn find the source in time to save the world? I wish to thank NetGalley and Simon & Schuster for this ARC in return for an honest review. I was not aware of any current medical mysteries, a category I used to enjoy. The author, Daniel Kalla , is an emergency room doctor, who puts his medical and scientific knowledge, as well as research into the epidemiology of the Black Death into a convincing narrative. The book was well written with believable and interesting characters. I sometimes felt a lack of connection with the prot 3.5 stars. The book was well written with believable and interesting characters. I sometimes felt a lack of connection with the protagonists, and an emotional detachment from the well-described events when I should have been feeling suspense and dread. There is a scramble to produce a vaccine, but any prevention or cure will come too late for the earliest victims. If the source of the infection is not found soon and contained, the results will be catastrophic. Millions could die. Alana is joined in the investigation by another disease expert, Byron Menke, from WHO, the agency where Alana previously worked. Alana suspects that the disease had its origin in bioterrorism. Byron has his doubts and plans to search for Patient Zero before the plague spreads and causes Europe-wide death unseen since the Black Death. A patient in Rome has contacted the sickness, and soon people are been admitted to hospital in Naples. Some are presenting either symptoms of pneumatic or bubonic plague. The investigation is drawn back to the remains of the ancient monastery. There Alana uncovers a medieval manuscript which may provide clues to the new potential epidemic. A doctor in the 1300s kept a journal of his observations and experiences at the time the Black Death was raging across Europe and decimating the monastery and surrounding area. His writings had been preserved in the monastery library. The chapters alternate between the events and thoughts of the doctor in this centuries-old document and the frantic rush of the present day investigators to find the cause of the plagues’ reappearance, and the hurry by medical researchers to invent an effective preventive serum and cure. Terrified crowds during the Black Death scapegoated Jews, blaming them for poisoning water sources. In the present day, some people start reacting to rumours that Moslem terrorists have unleashed the disease in an act of terrorism. Alana and Byron are horrified to learn that the plague is being carried towards Asia, which would result in worldwide death of cataclysmic proportions. Is it possible to stop it in time? In 1348 the Black Death came to Genova, Italy. A young barber surgeon, Rafael Pasqua, documents the effects of the terrible plague on his community. The epidemic ravaged most of Europe and left its population decimated. It's not been seen again for hundreds of years. Present day Genoa: A construction worker dies suddenly and had first exhibited the classic symptoms of bubonic plague. Is this Patient Zero in a new outbreak of this dreaded disease? Before long, the city is inundated with more cases In 1348 the Black Death came to Genova, Italy. A young barber surgeon, Rafael Pasqua, documents the effects of the terrible plague on his community. The epidemic ravaged most of Europe and left its population decimated. It's not been seen again for hundreds of years. Present day Genoa: A construction worker dies suddenly and had first exhibited the classic symptoms of bubonic plague. Is this Patient Zero in a new outbreak of this dreaded disease? Before long, the city is inundated with more cases including the more lethal form, pneumonic plague. A team from the World Health Organization descends on the city along with Alana Vaughn, an infectious diseases expert with NATO who is summed there by an old paramour. It is indeed Black Death. Is this somehow a reoccurrence of the plague related to an old monastery that was being torn down or is it bioterrorism? The doctors, scientists and epidemiologists are in a race against time as the horrible plague spreads across Italy. NO SPOILERS. If you know me, you know I absolutely love thrillers that involve some sort of medical condition and I'm totally obsessed with books written about the Black Death. This one did not disappoint and I devoured it in a few hours unable to set it down even for a second. I loved the scientific details and the descriptions in both past and present of how the disease affected the people and the communities in which it occurred. This is a story of disease, yes, but it's also a story about the individuals who travel to all parts of the world to contain and eradicate evolving bio threats. When a disease of this magnitude re-emerges, it can rapidly spread and develop into a pandemic and those infectious disease experts are there to prevent calamity and save lives. I liked the writing, the characters and the story and highly recommend it. Definitely a book I'm going to be pushing on all my friends this spring! “We All Fall Down” is a thought-provoking book which looks squarely at a cataclysm of unimaginable proportions. The Black Death has arrived in Italy and the story will tell us how people will react to the catastrophe. Will Dr. Alana Vaugh, an infectious diseases expert with NATO find the source in time to save the world? Daniel Kalla who practices emergency medicine in Vancouver, British Columbia, Canada has once again written an absolutely riveting drama hard to put down. Very knowledgeable in t “We All Fall Down” is a thought-provoking book which looks squarely at a cataclysm of unimaginable proportions. The Black Death has arrived in Italy and the story will tell us how people will react to the catastrophe. Will Dr. Alana Vaugh, an infectious diseases expert with NATO find the source in time to save the world? Daniel Kalla who practices emergency medicine in Vancouver, British Columbia, Canada has once again written an absolutely riveting drama hard to put down. Very knowledgeable in the subject, his words plunges his readers’ right in the middle of the crises where experts are on the hunt to track down Patient Zero. Their search brings them across an 800 year monastery and a medieval journal that may be key to understanding and solving the outbreak. This 10th novel that combines suspense with a historical mystery is told in alternating chapters drawing us back to the Middle Ages where the initial outbreak took place then we are smoothly taken forward to today’s crises where NATO, WHO and local representatives need to find a solution. Mr. Kalla demonstrates a masterful skill needed for genuine suspense by capitalizing and building on the danger of exposure and the panic ensuing. The writing shines with medical and scientific expertise. No person is left unscathed, no family untouched. Death grows insatiable……this is scary to think, could biological terrorism really happen, how fast can viruses spread and how safe are we? Mr. Kalla is one of my favourite authors and I wouldn’t miss any of his books. I read them all….This latest is a well-done nail biting thriller…. I received this ARC from the publisher Simon Schuster via NetGalleys for me thoughts. 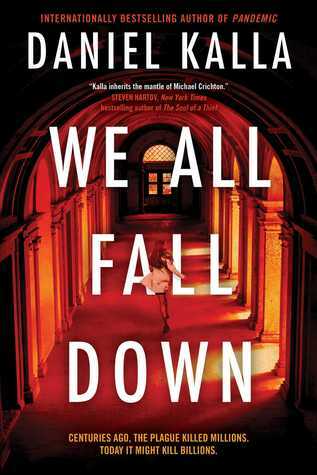 We All Fall Down reads like a high-octane two part episode of an interchangeable average network television show. We All Fall Down is told through multiple perspectives, the main character, Dr. Alana Vaughn, an 800-year-old diary, and the perpetrator of the release of the plague. Dr. Vaughn is your standard capable female main character. She’s intelligent, physically capable, and sensual with a romantic past connection to another character. She isn’t fleshed out given much depth. Mind you, all the We All Fall Down reads like a high-octane two part episode of an interchangeable average network television show. Dr. Vaughn is your standard capable female main character. She’s intelligent, physically capable, and sensual with a romantic past connection to another character. She isn’t fleshed out given much depth. Mind you, all the characters are not given much depth since the plague, it’s release, and containment are the main focus of the story. I disliked the diary chapters. I found them tedious and annoying as they often cut in the middle of the action to give readers information that isn’t relevant until later in the story. Though, Kalla does a fine job of portraying the setting and showing readers the atmosphere and chaos the Black Death created. The reason I rated the novel three stars instead of two is because the science is on point. The portrayal of the scientists and epidemiologists are credible and informative without being overly obtuse. The science of the disease itself and its containment was fascinating to read. Kalla is a doctor himself and it shows in this regard. Overall, We All Fall Down is an okay read that passes the time if you’re looking for a high stakes story rooted in science. THEN THE WORLD - AND WE ALL FALL DOWN. The book is fast paced and had me on the edge of my seat wondering if Alana, Nico, Byron and company were going to be able to get to the bottom of who unleashed the plague and when or if they could get it under control. The book was well written with believable and interesting characters. I really liked the medical aspect of the book and how the scientists and doctors react to a dormant disease suddenly becoming active all over again and with them struggling to cope with the lack of vaccines available and also the consideration of the disease used as a bio-weapon was really interesting. This is scary to think, could biological terrorism really happen, how fast can viruses spread and how safe are we? I thoroughly enjoyed this book and look forward to reading more from this author. Thank you NetGalley and the publisher for a copy of this book in exchange for an honest review. This was another absolutely brilliant story by Daniel Kalla. Dr. Alana Vaughn is brought to Genoa, Italy by a former flame to examine a critically ill patient of his. Alana is an infectious diseases expert with NATO. She is frightened by the discovery that the patient is suffering from the Black Death, in other words the plague. Alana wants to explore the possibility that this is an act of bio-terrori Thank you NetGalley and the publisher for a copy of this book in exchange for an honest review. Dr. Alana Vaughn is brought to Genoa, Italy by a former flame to examine a critically ill patient of his. Alana is an infectious diseases expert with NATO. She is frightened by the discovery that the patient is suffering from the Black Death, in other words the plague. Alana wants to explore the possibility that this is an act of bio-terrorism, however her colleagues at her former employer WHO disagree with her. They start a massive search for Patient Zero. Along the way they realize that excavation at an 800 year old monastery ties into the epidemic. Alana is given access to a medieval journal that documents the plague spread across Europe. As the deadly disease spreads to other cities, they realize that the answers they seek are on a ship headed to Asia, where if the plague is released, the results would be catastrophic. A fast paced dual time medical thriller set in Genoa Italy in both current time and during the Black Plague of the fourteen century. Heaps of action, accurate medical details and engaging characters all rolled into a rocket strapped plot make for the best medical thriller I have read in ages. While the present story line races off to stop the next pandemic, the historical section grounds the reader in the grim reality of the Black Plague in a sweet and sorrowful story of a barber surgeon battling his corner to if not save give comfort to his patients and community with compassion, the science of his age and a great deal of ingenuity. With authors like Tess Gerritsen and Michael Palmer being a pretty sure bet, the literary arena can be a pretty crowded venue for new authors looking to worm their way into the affections of lovers of the medical thriller genre. But, with no small amount of native pride, I can recommend Canadian author Dan Kalla as being worthy of a place of honour on your shelves. Those who read medical thrillers regularly are only too aware that the field is chock-a-block full of weary derivative plot lines but in We All Fall Down, Kalla has crafted a barn-burner pandemic possibility tale that has a basis unlike anything you’ve ever seen or heard before. Suffice it to say, without treading into spoiler territory, that Kalla’s frightening scenario revolves around the bubonic and the pneumonic plague. And we’re not talking here about any old garden variety plague. Kalla has built a fascinating novel around the possibility of a DNA reprise of the actual “Black Death” virus that wiped out half of medieval Europe in the 14th century. Kalla has also filled the pages with plenty of other issues that keep the plot moving, compelling, believable and poignant in today’s embattled world – misogyny, xenophobia, anti-Semitism and Islamophobia, schizophrenia and mental illness, to name only a few. It’s also worth observing that Kalla is a skilled writer who has a marked ability to convey the science behind his plot in an informative, interesting fashion. No condescension or dumbing down for the masses here. It’s also clear that Kalla’s skills as a thriller writer have come a long, long way since his debut with Pandemic. I’m certainly going to head out to my local bookstore to find one or two of the other novels that formed part of his path between then and now. I love Daniel Kalla's style of writing, especially when dealing with medical issues/terms. He makes it clear and understandable without going on and on about boring things that will just clog up the story. This book is thrilling. I love a good pandemic type story and this one does not disappoint. While we "sort of" know what is happening before the main characters do, its still intriguing as Kalla leaves a lot of unsolved issues and keeps them to the very end. Although I had to read this slowly (t I love Daniel Kalla's style of writing, especially when dealing with medical issues/terms. He makes it clear and understandable without going on and on about boring things that will just clog up the story. Although I had to read this slowly (time constraints) I was always annoyed that I had to put it down for "real life" and looked forward to picking it up again. Thank you to Simon & Schuster and NetGalley for an advance copy of this book in exchange for an honest review. An eight hundred year old monastery in Genoa, Italy is being torn down to make way for more modern buildings. Vittoria Fornero is in charge of the construction site and isn't going to let anything slow down the project, including a monk that lived at the former monastery. Brother Silvio shows up at the site daily with a fold up chair and a black satchel and watches the progress of th Thank you to Simon & Schuster and NetGalley for an advance copy of this book in exchange for an honest review. An eight hundred year old monastery in Genoa, Italy is being torn down to make way for more modern buildings. Vittoria Fornero is in charge of the construction site and isn't going to let anything slow down the project, including a monk that lived at the former monastery. Brother Silvio shows up at the site daily with a fold up chair and a black satchel and watches the progress of the excavation. The monk has been spooking some of the workers with tales of old concerning the monastery. All of this along with a sudden bout of illness is too much for Vittoria and she collapses at work. Dr.Alana Vaughn receives a text from a former colleague, Dr. Nico Oliva, whom she worked with at the World Health Organization. Two words had her packing for Genoa immediately. Those two words were "the plague". This is not the first time in history that the Monastery has been at the center of a deadly outbreak and Alana and Nico must discover how it is spreading now. This story is told from the perspective of two time periods, that of the medieval outbreak recounted by Rafael Pasqua, and from the present day investigations of Doctors Alana Vaughn and Nico Oliva. The modern day doctors race against time to find the source of the plague and try to contain it before it ravishes the population of Italy as it did once before centuries ago. The journals of Rafael tell about the horrors of the bubonic plague sweeping thru his time. Both timelines have one thing in common and that is the monastery. Fast paced story that has both timelines told in separate narratives that are seamlessly tied together. A captivating thriller, and a very thought provoking "what if?" scenario. Current day Italy and it seems the Black Plague has re-surfaced. The authorities are on a perplexing chase for the hows and whys, trying to contain the spread before it reaches cataclysmic proportions. Has it been transferred from Africa? Is it bio-terrorism. Does it have ties to the Plague that devastated Europe centuries ago in 1348? I've never read what is considered a "medical thriller", but a Canadian author who moonlights as an ER Physician (okay, he is an ER Physician who moonlights as an author) is pretty darn cool. His first book Pandemic, inspired by the SARS outbreak, also sounds pretty darn cool, I might have to go back and read that if this works out for me. This was a well written and believable medical thriller. Kalla obviously draws on his own knowledge to build a story that makes sense logically, but is also interesting and suspenseful, without being too over saturated with medical jargon. I enjoyed following the WHO and NATO experts as they mapped and tracked this spreading disease to its source, trying to sort out whether this was a natural resurrection of the black plague, or bioterrorism. Both situations are frightening, but what it ends up being is even more frightening and I liked that little twist. However, I did find that my interested in the story waned about three quarters of the way through. I guess the repetition of more cases coming into light and the experts kind of running in circles as they tried to find the reason for the spread and develop a vaccine eventually became too repetitive for me and I was anxious for things to move ahead a bit quicker. That’s my own impatience at work, though. Overall, I enjoyed my first journey into this genre of thrillers, but I feel like this format could become familiar after a while without a lot of really unique approaches. That said, Kalla handled it quite well and strayed from presenting a predictable outcome, which I applaud. A very good read. A middle ages plague surfaces in Genoa when a monastery is sold by the church and it's torn down. A race for WHO to find the source of the plague, to isolate those infected, trying to cure the infected and to try to contain it to a geographic area. A parallel recounting of a middle ages physician trying to treat the same plague in the same city. Easy to read, hard to put down. Switches from present to Middle Ages were very well done. Thought provoking, very well written and I am sure this will not be the last book I’ve read from a Daniel Kalla. If you like books that depict a race against time, usage of science and medical investigations, suspenseful situations and a search for answers following clues, then this book is for you. The enemy: Black Death, a plague from the past that wiped out millions in the past and now threatens to wipe out billions. The MC must race against time to find out if terrorism is responsible, or something else. There were a few slow spots that made the story disconnect, but other than that I enjoyed it. A quick fast paced engaging story, where there was lots to learn. Glad I read it. Great read, would highly recommend it! I liked this book a lot. Kinda like a mix of the old Robin Cook and Michael Crichton. The book was well-written, though definitely not my cup of tea. It was tough to engage me into the pages. Daniel Kalla does it again. Very spell binding. Born, raised, and still residing in Vancouver, Kalla spends his days (and sometimes nights) working as an ER Physician in an urban teaching hospital. The idea for his first medical thriller, PANDEMIC, sprang from his clinical experience in facing the SARS crisis of 2003. He has written five science thrillers and or medical mysteries, delving into themes and topics as diverse as superbugs, drug addi Born, raised, and still residing in Vancouver, Kalla spends his days (and sometimes nights) working as an ER Physician in an urban teaching hospital. The idea for his first medical thriller, PANDEMIC, sprang from his clinical experience in facing the SARS crisis of 2003. He has written five science thrillers and or medical mysteries, delving into themes and topics as diverse as superbugs, drug addiction, prions, DNA evidence, pandemics and patient abuse. Kalla’s last book, THE FAR SIDE OF THE SKY, is a historical novel set in Second World War Shanghai against the dramatic backdrop of converging cultures and ideologies. His latest, RISING SUN, FALLING SHADOW continues the story of the Adler family through 1943, the bleakest year in war-torn Shanghai. His books have been translated into eleven languages, and two have been optioned for feature films.